The compatibility problem is to find a figure that can be tiled with each of a set of polyforms. Polyomino compatibility has been widely studied since the early 1990s, and two well-known websites, Poly2ominoes by Jorge Mireles and Polypolyominoes by Giovanni Resta, present the results of their authors' systematic searches for compatibility figures. Mireles's site includes solutions by other researchers, especially Mike Reid. So far as I know, polyomino compatibility has not been treated in print since Golomb first raised the issue in 1981, except in a series of articles called Polyomino Number Theory, written by Andris Cibulis, Andy Liu, Bob Wainwright, Uldis Barbans, and Gilbert Lee from 2002 to 2005. The websites and the articles present a wealth of polyomino compatibilities. They do not show all current results. 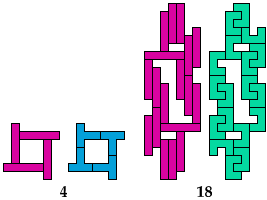 I do so below, for pentomino-pentomino compatibility only. 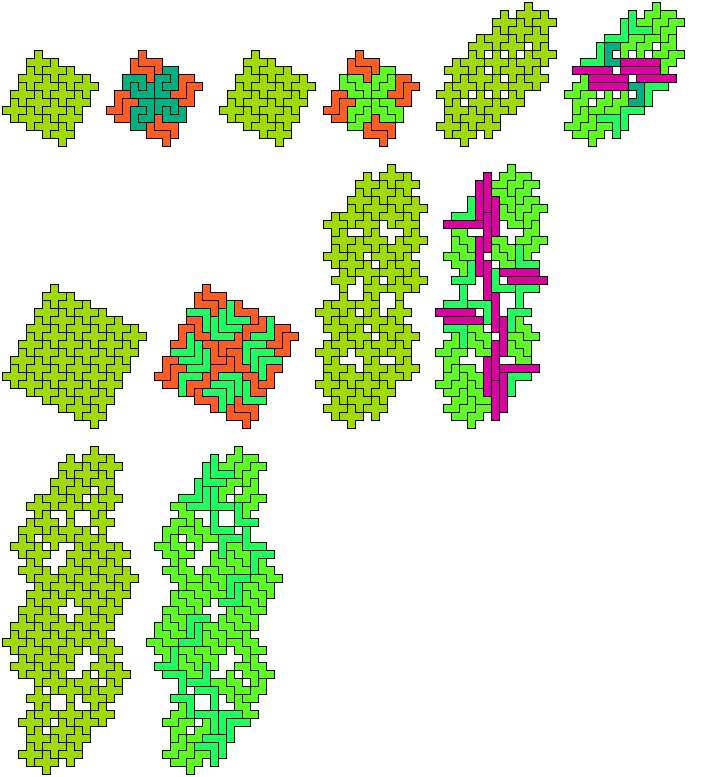 I am not prepared to maintain a current catalogue of results for other kinds of pairs of polyominoes, or for larger sets such as the pentomino triples that Livio Zucca has collected here. I also show holeless variants. So far as I know, these have not appeared elsewhere. 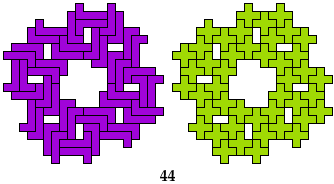 For compatibility figures with an odd number of tiles, see Livio Zucca's Pentomino Odd Pairs. For Galvagni compatibility (self-compatibility), see Galvagni Figures & Reid Figures for Pentominoes. This table shows the smallest number of tiles known to suffice to construct a figure tilable by both pentominoes. The names used for the pentominoes are Golomb's original names. X 2 × 44 16 4 4 × × ? * 2 ? 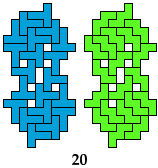 The thinnest compatibility figure for a pair of pentominoes is not always that with the smallest area. 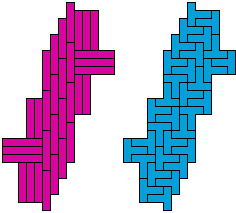 Here are the thinnest known solutions for pairs of pentominoes. Are there any other hybrid solutions? The green figures represent holeless tilings that are minimal even without the condition of holelessness. I 10 * 2 2 2 32 ? 10 10 × 2 ? U 4 ? 2 2 2 ? * ? 2 × 2 ? X 2 × × 16 4 4 × × ? * 2 ? I omit solutions that are the same as in Basic Solutions above. So far as I know, the following solutions are minimal. They are not necessarily uniquely minimal.